It has been a rough stretch for the Carolina Hurricanes - they haven't made the playoffs since 2009. Struggling for that long gives you opportunities to add young players, though, and this is now a team that has a very nice young core. Combine that with what has been a very strong offseason, and it's easy to believe that this team is moving in the right direction. They still have a lot of work to do, and there will still be bumps, but this is a better team now than they were last year, and they will only improve with time. The Hurricanes were one of several teams with glaring goaltender needs, and they wasted no time addressing them. Scott Darling was a pending free agent, and the Blackhawks weren't going to pay him, so Carolina traded a draft pick for his rights and then signed him to a four-year deal. He has never been a starting goalie, but his numbers have been strong in relief, and he had 18 wins in 28 starts last year, so it's not like he's been a part-time player. If he can make the transition to No. 1 guy like Cam Talbot or Martin Jones have in similar situations then Carolina will be in strong shape. And they need the help - Cam Ward and backup Eddie Lack, who left for Calgary, ranked just 26th in the league in save percentage, and that really hurt the team. Darling wasn't the last addition through trade - or the last addition from the Blackhawks. In two separate deals with Las Vegas they added defenseman Trevor van Riemsdyk and center Marcus Kruger for draft picks. Both guys were with Chicago last year - van Riemsdyk was taken in the expansion draft, and Kruger was traded to Vegas two days before he was sent to Carolina. All three players from Chicago have won Cups, so they bring valuable experience. The team also dipped into their own past for more veteran experience, bringing back Justin Williams, who will turn 36 before the season starts, on a two-year deal. Williams won a Cup in Carolina in 2006, during his five years with the team, and then went on to win two more with the Kings. He was MVP of the last Cup run. Last year he had 48 points in 80 games for Washington, so he still can make an offensive impact - though leadership is a bigger part of his role here. Carolina had only the 12th pick in the draft this year. They did well - center Martin Necas of the Czech Republic has big upside and could potentially even make the league this year. The team is short on truly established offensive threats right now. 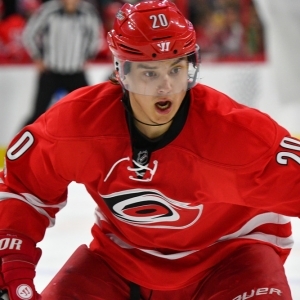 Jeff Skinner had a very impressive 37-goal season, and Sebastian Aho, who is only 20, had 24 goals. Everyone else, though, had less than 20. Williams and Kruger will have an impact, and the team will be hoping for serious progress from young guys like 22-year-olds Teuvo Teravainen and Elias Lindholm and 24-year-old Victor Rask. They could use another top two center to make it all work, though. Luckily, they have a total embarrassment of good young defensemen that they could draw from in a trade to get what they need. Noah Hanifin is already elite at 20, Brett Pesce and Jaccob Slavin have both been excellent, and both have big new deals to show for it. And Justin Faulk is a top four guy as well. And then they have a couple of other elite young prospects in the pipeline - 21-year-old Haydn Fleury, and 19-year-old Jake Bean. Bean plays his junior hockey three miles from my house, so I have seen him plenty and he is very impressive. Combine all the young talent we have already talked about with a couple other guys coming along, and you have a team that could really take off in a year or two. Of course, young players alone don't guarantee success - ask Edmonton in the pre-McDavid days. The team has an absolutely brutal October. Nine of their 10 opponents are likely playoff squads, and the 10th, Winnipeg, won't be terrible. We will learn a whole lot about this squad after that stretch of games. For their sake we can hope they don't win up falling into a hole before things have even really gotten started. Bovada has Carolina at +6600 to win the Stanley Cup, which places them ahead of just six teams. BetOnline has them at +2500 to win the Eastern Conference, which places them 13th - one spot lower than they finished last year. They are tied with Philadelphia as the second longest shot on the board to win the Metropolitan Division at +1400. Only New Jersey at +2500 is at a longer price. The season win total is set at 41.5, which is a nice improvement over their 36 wins last year. I like the direction of the team and I like the moves they have made. If they were a stock I would be buying. The season win total is pretty aggressive, though, so there is sadly no value in playing it. I don't think they will be a playoff team yet, but they will be close, and they are going to be competitive. They are really building something here.